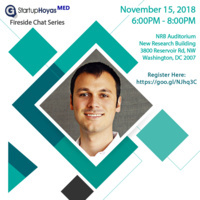 Please join us for a conversation with Dr. Nate Gross, Co-founder of Doximity and Rock Health. The night will begin with dinner before the chat with our speaker. To conclude, attendees will have the opportunity to network with other thinkers from the community. We hope to see you there! This event is open to the public. If you have any questions, feel free to reach us at StartupHoyasMED@gmail.com or on our website. Dr. Nate Gross is the co-founder of Doximity, the professional network used by over 70% of US physicians. He is also the co-founder of Rock Health, the full-service venture capital fund for digital health startups. He serves on the advisory board for the SXSW Accelerator and the Institute for Pediatric Surgical Innovation at Children's National Medical Center, and serves as affiliated faculty for the Clinical Informatics Fellowship at Stanford.